The other day my daughter asked me to cook her some yummy boiled eggs for breakfast. As I was making them I remember a bunny shaped hard boiled egg picture that I saw on Pinterest. I was kinda bumbed that there was no link or directions on how to make it. I tried to make it from memory of the picture and it was so easy. All you need is 3 items. Boil your eggs like normal. Let the eggs cool to the tempature you like. Peel the shell off the eggs. Take one egg and cut in half, long ways. One half will be the body the other half will be the head. Cut the second egg the same way. Take the yellow out of the second egg. On the second egg cut one half of the white in half, cut directly in the middle. That rounded part will be the basket. Take the extra whites and cut to fit for legs, feet, basket handle, and ears. I just layed the pieces on top of where I wanted them. That yellow that was taken out of the second egg, you will now roll a small ball for the eye, nose and mouth. The rest of the yellow place in the basket. 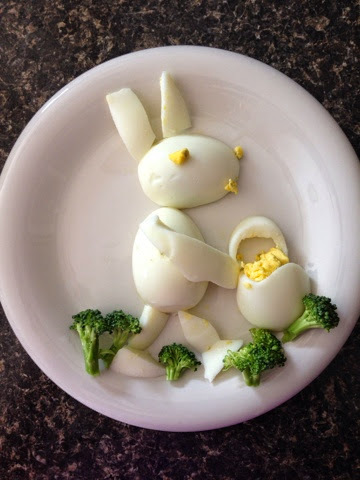 To finish place broccoli around the bottom to make the bunny look like it is walking in the grass. Now time to serve and enjoy. Hope you have a wonderful and blessed Easter! Let me know if you make this and what your kids say about it. My daughter loved it.